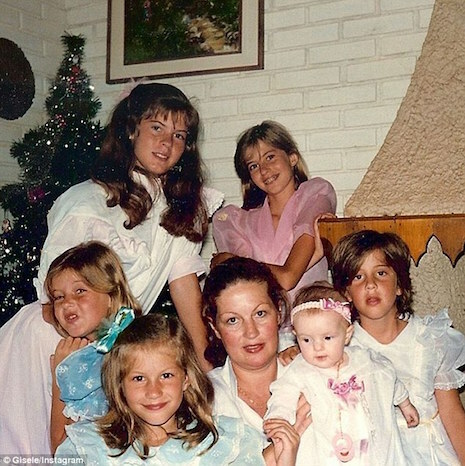 Supermodel Gisele Bundchen thanked her mom on Mother’s Day for raising a houseful of SIX beautiful sisters! She posted a photo of her mom Vania and her girls when they were young. Gisele has a TWIN sister Patricia but they are not identical twins – they are fraternal. The twins signed up for modeling school when they were 13 and Gisele was “discovered” and signed a modeling contract at 14. But she didn’t leave Patricia behind – her twin is now her manager and spokesperson. She looks just like her Mom. Why is Claire Danes in the front of the pic?